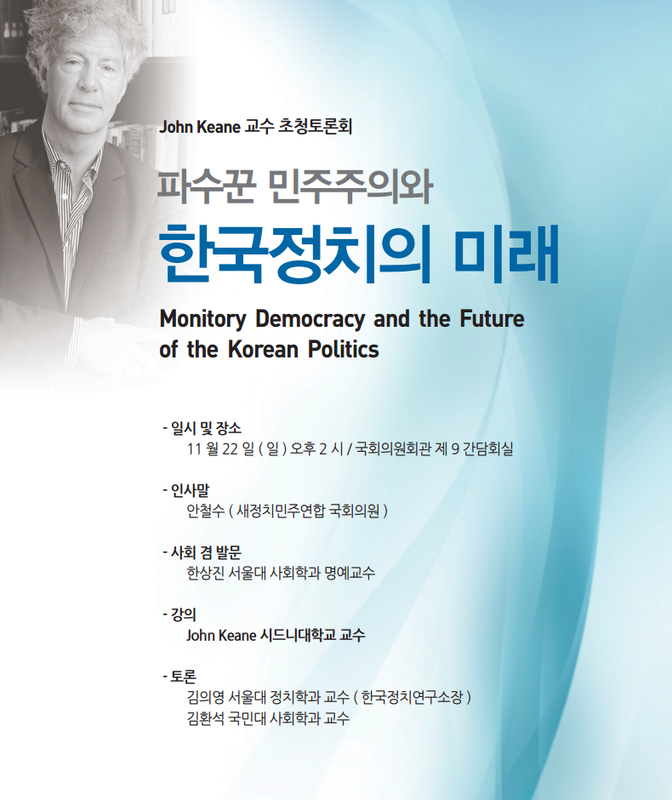 Professor John Keane of the University of Sydney gave a special lecture entitled 'Monitory Democracy and the Future of Korean Politics' at the National Assembly on November 22nd in front of a large crowd of interested onlookers and media. National Assemblyman Cheol-Soo Ahn was present to give congratulatory remarks and Professor Sang-Jin Han of Seoul National University gave an introduction to the lecture for better contextualization in Korean society. Professors Eui-Young Kim of Seoul National University and Hwan-Seok Kim of Kookmin University were the designated debaters. This event was co-hosted by the Policy Network and the Joongmin Foundation for Social Theory.